There are so many books on preparation for GMAT that it can sometime get very difficult for a student to make a choice. The following list includes the 10 best-selling and most useful GMAT preparation books that students have found useful and beneficial. The Official Guide, published by Wiley, is brought out by the Graduate Management Admission Council, or the GMAT team. This makes the book a must-have, handy guide to prepare for your exam. The edition for 2016 features types of questions in Qualitative, Verbal and Integration Reasoning sections. 900 practice questions are included in the guide, with explanations of answers, along with essay topics, math review and a diagnostic test. In addition, users gain access to the online question bank, where they can create practice tests from the questions in the book, along with other resources, videos and tips from insiders. Veritas Prep provides test preparation and admission consulting around the world, and this set of 12 books is the GMAT prep course minus the instructor. This study kit gives users access to over 1000 questions for practice, along with access to online resources. Books included in the set are: Advanced Verbal Strategy, Foundations of GMAT Logic, Critical Reasoning, Arithmetic, Sentence Construction, Algebra, Geometry, Data Sufficiency, Reading Comprehension, AWA & Integrated Reasoning, Advanced Word Problems and Statistics & Combinatorics. This study kit will give you 10 guidebooks of which five are devoted to Quantitative subjects, four to Verbal topics and one for strategy. They are easy to follow and well-written, and students have consistently reviewed the books as helping to boost their scores dramatically. The set also includes six computer-adaptive practice tests, over 200 practice questions in addition to these, a guide that addresses the Integrated Reasoning section, and sets of practice questions from the Official Guide along with detailed explanations of answers. When you purchase the Kaplam GMAT Premier 2014, you also get access to six practice tests, along with a DVD for digital access to the contents of the book. You also get access to online tests, video lessons and mobile-friendly versions of the book. GMAT Premier takes you through a thorough prep of the Math and Verbal sections of the GMAT test, as well as the Integrated Reasoning section. This book subtitled Expert Advice through Test Day is published by the international Manhattan Prep Publishing. It includes plenty of tips for test day, along with time management, study tips and also what to eat during your GMAT preparation. The book also comes with 6 computer-based tests for practice, along with suggestions on how to handle the different types of questions on the test. If you are looking for a guide to the Verbal section of the GMAT exam, this workbook will help you with everything from grammar to paragraph structure, as well as the specific verbal skills that you need to know. There are practice sets for all types of Verbal questions and detailed explanations of answers. The book also gives you test-taking tips that are proven to work, and thorough reviews of essential concepts. This book will take you through the critical reasoning areas of GMAT, and is considered one of the best in the field. 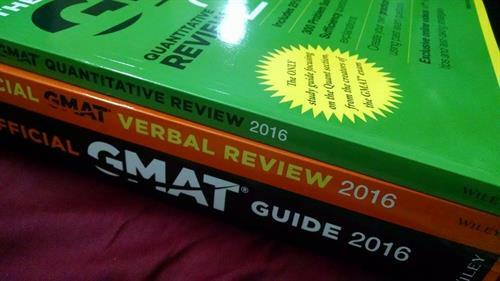 Written by an ex-LSAT instructor with over 20 years of experience, the book breaks down GMAT for you. You will learn how to recognize question types, separate correct from incorrect answers, improve your speed and accuracy etc. Yet another guide by Manhattan publishers, this is designed not for beginners but for those who want to score above 650. The guide takes you through the steps and techniques to approach the most difficult quantitative questions in GMAT. The book also gives you plenty of practice with challenging quantitative problems. A very popular guide for the math section of GMAT, this book explains every type of questions you may encounter in the exam, in over forty sections with drills at the end of each. The book offers more than 500 exercises, over 300 new practice questions unavailable elsewhere and 100 challenging questions to prepare you for the toughest questions on the paper. Good explanations along with diagrams along with many insights and tips make this a popular and effective guide. Approach the Verbal section of GMAT with greater preparedness with the PowerScore Bible for Verbal skills. It discusses all three verbal sections - Reading Comprehension, Critical Reasoning and Sentence Correction - in great depth. It has 85 drills along with 125 practice questions. Italy vs Germany - which is the better study abroad destination? Are you considering Italy and Germany for your higher studies abroad? In this article, I have done a detailed comparison of advantages and disadvantages of studying in Italy and Germany.